This year I market I noticed a few things. 1- My quilt photography skills have progressed to the point that my new photos made my older photos look a little sad. 2- Villa Rosa sends my patterns all over the world!!!! …But very few people know who I am. -Is it weird to be jealous that my patterns get to go to all sorts of cool places while I stay home? 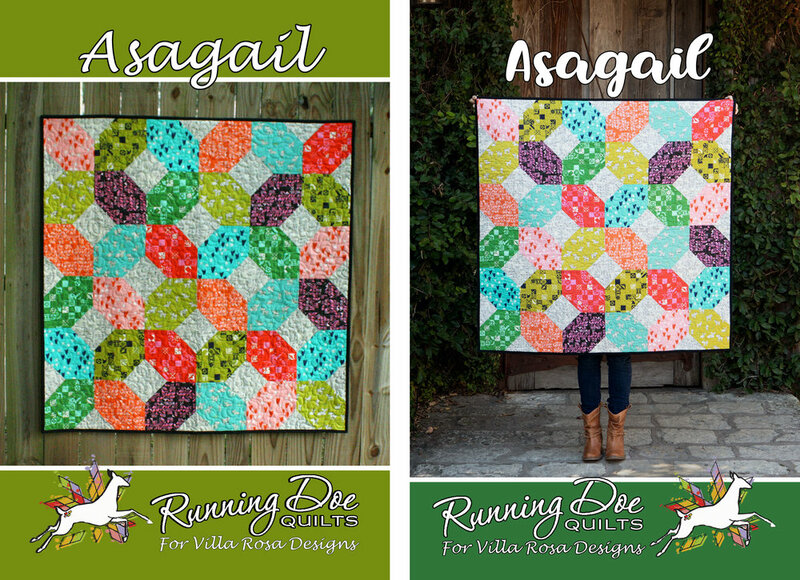 To tackle #1, I’ve started rephotographing all the quilts I still have and updating the covers… Did I mention that I have 36 patterns in circulation with Villa Rosa? And that I try to write 1-2 new ones every month?! It feels like for every 10 I rephotograph, I remember 12 more I need to rephotograph! Quilt holding is exhausting work and asking Spencer to hold 36 quilts for one power photography session would probably get me dirty looks. So to get through this mountain of quilts- I’ve divided them into groups and started tackling one group at a time. The first group got to go to New Mexico for photos in the snow. I took 10 because that was all I could pack into the car around our luggage. Lighting in the snow is amazing- tackling the wind another story. But we got them done! Round 2 strives to tackle #2. It involved dragging my 9 smallest quilts to Gruene where my sweet friend Jodie and her daughter Claire took photos of the quilts- with me in them! I have to admit that I’m still a little nervous about sending out patterns with me on the cover, but I really wanted to put myself out there and say hi to the world. Also- this way I can travel Flat Stanley style to all those cool places! So there you have it- Hi! I’m Catherine. Quilter, wife, mom. I like to write patterns, I’d like to meet more of you in person. If you see me Flat Stanleying it up any place cool be sure to send me a photo. I’ve decided to hold onto all my samples a while longer, so if you’d like me to come do a trunk show for your group just give me a call. Thanks for reading! I’ve been collecting storybook fabrics since before Asa was born with plans to make something special for him. 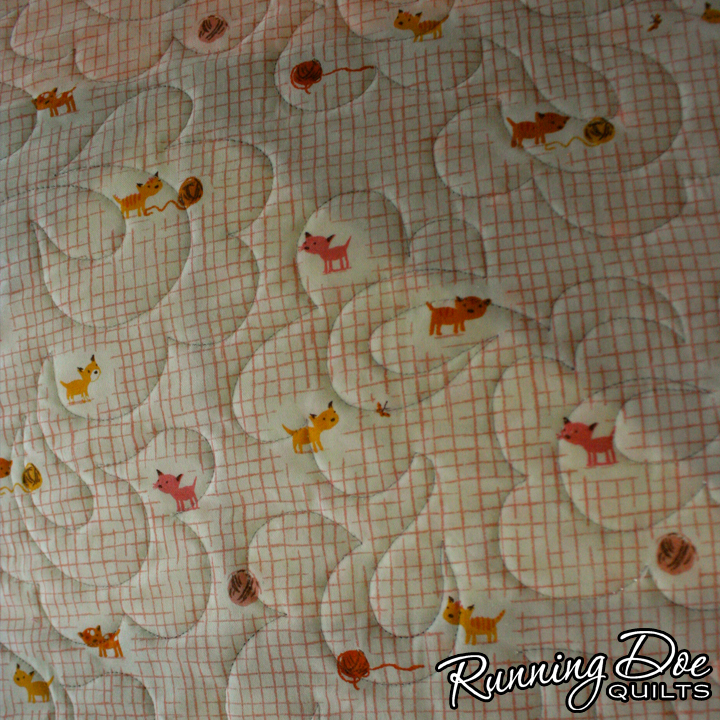 This quilt is extra special because it marks the move from crib to big kid bed. Thankfully he loves his bed and is very excited about being a big kid so the transition was easy. The big kid bed is a custom captain’s bed made by Grampy & Grammy so he can store all his clothes in it and not take up valuable play space with a dresser in his room. 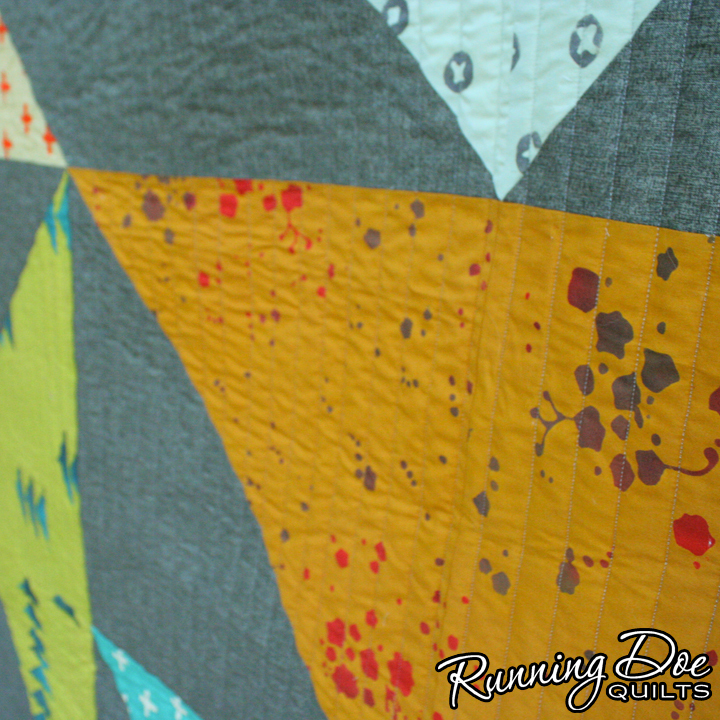 The quilt hides lots of fun surprises. I used mostly licensed storybook fabrics. He has his name, all of his favorite letters, a kid from the Eric Carle Brown Bear book that looks Iike him, dinosaurs, rockets ships, favorite foods...the list goes on forever! I tagged everyone I could over on Instagram but I know I missed quite a few. If anyone wants to volunteer to count how many different fabrics are in the quilt- I’ll ask you if you’re crazy! I proof, I edit, I re-read and still…something always slips by. This time it was the cutting chart on p4. The measurements for cutting were a little snug on a few pieces. I’m sorry for any trouble this has caused anyone. My best guess as to what went wrong is that I used the measurements I always used for the rough draft paper piecing templates without the seam allowances marked. When the seam allowances are marked on the final template you get this crazy long point sticking out on the corners that I didn’t account for. The good news is that this chart isn’t key to making the quilt work. 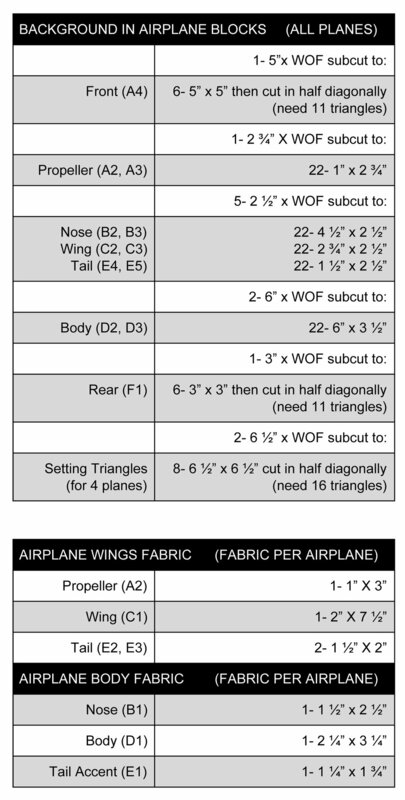 It’s just the approximate cutting instructions for the airplane block background fabrics. I almost didn’t even include it but decided to because if you like to chain piece you can make all 11 blocks really quickly once you’ve cut the background to the approximate sizes. 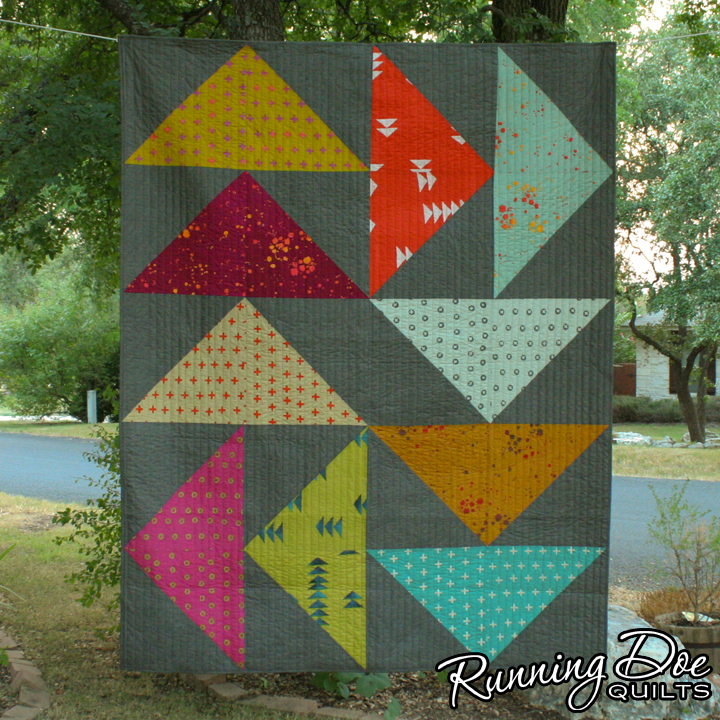 You can just ignore it completely and cut your pieces to size as you go the way you normally do for paper piecing and it will go together perfect. Thankfully I haven’t distributed a crazy number yet, so I’m going to try and track everyone down to give them the edit. I’m also planning to order stickers with the correct chart to stick over the old one in the pattern. If you got the pattern from me and need the sticker, please let me know. It may be a few weeks before I have them in my hands but I’ll be sure to mail them out as soon as I do. If you’ve gotten to the pieced appliqué instructions and need something more visual, hang tight. A quick tutorial is on my todo list for January. Again, I’m sorry if this caused any trouble. Thank you for supporting me and my business! It’s the day after Thanksgiving…I can talk about Christmas now, right? 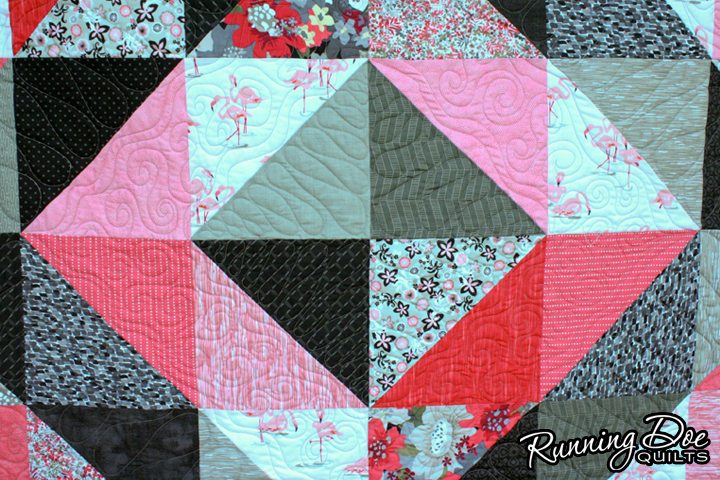 This quick and easy tree quilt will be part of Villa Rosa’s December auto-ship. I’d say that it’s too late to wrap it up for this Christmas, but I know how fast it goes together! Also, you can always do like me and neglect the housework…sewing goes much faster when you’re hiding from the mess! 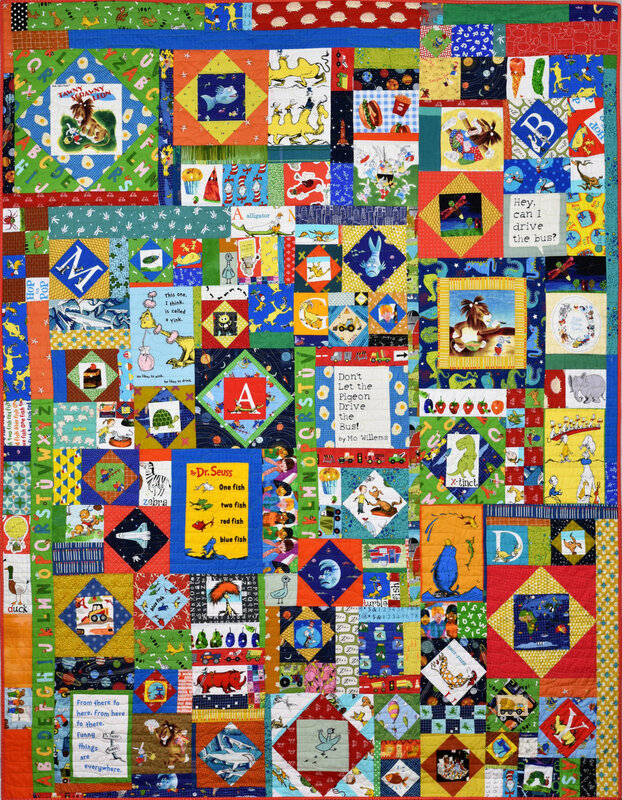 I love all the fun Christmas fabrics in this quilt but my 2 favorites are the Holiday Gals by Michael Miller in the background and the Candy Corn by Michael Miller in the tree. The holiday cats on the ornaments make me really happy too! If you’ve been hoarding great Christmas fabrics I highly recommend fussy cutting 1 square of each to make your ornaments and show them off! It will be another week before the pattern is officially ready to ship, but if you need it before then I’m happy to send a digital version. 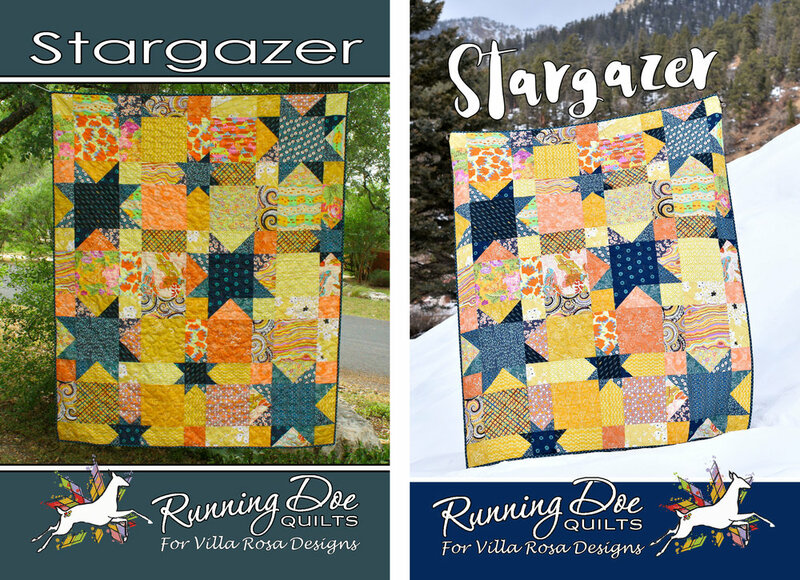 When it’s ready it will be at your local quilt shops or online through Villa Rosa Designs. 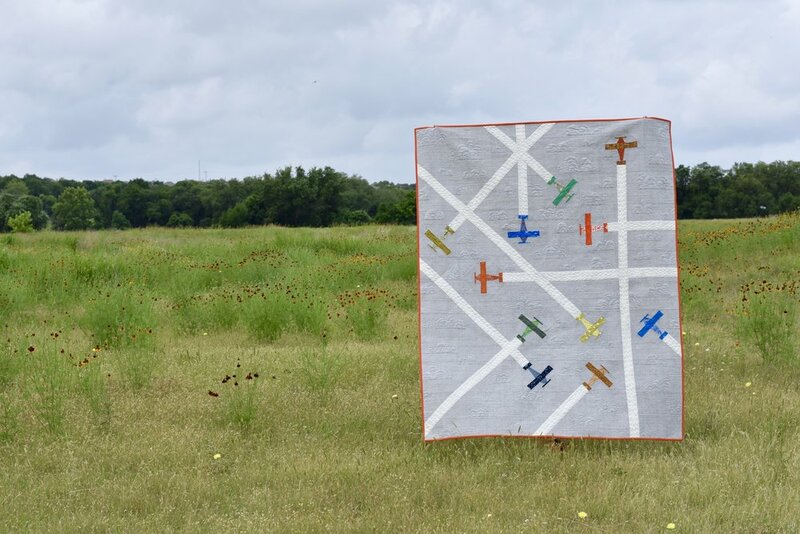 So excited to announce that my pattern Flight School is now available! The original version was made as a gift for a friend who is a pilot and was having a baby girl. It was done with all sorts of crazy improv measuring and fitting. As much as everyone loved it, there was no way it was becoming a pattern. There is not enough paper in the world to explain that process! 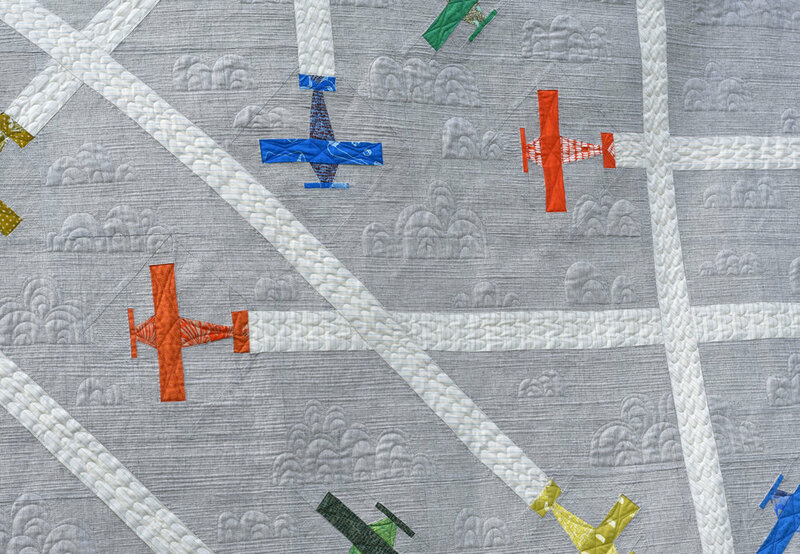 Then, thanks to a great suggestion from a friend to use pieced appliqué on the flight paths; I tried it again with a much more calculated approach and…Wa-la! It seemed to just click into place. The pattern involves paper piecing 11 airplanes (I know that scares some people but trust me when I say it is the easiest paper piecing you will ever do), assembling them into a finished top following my carefully mapped out diagram (no collisions here), and then adding the flight paths using pieced appliqué. 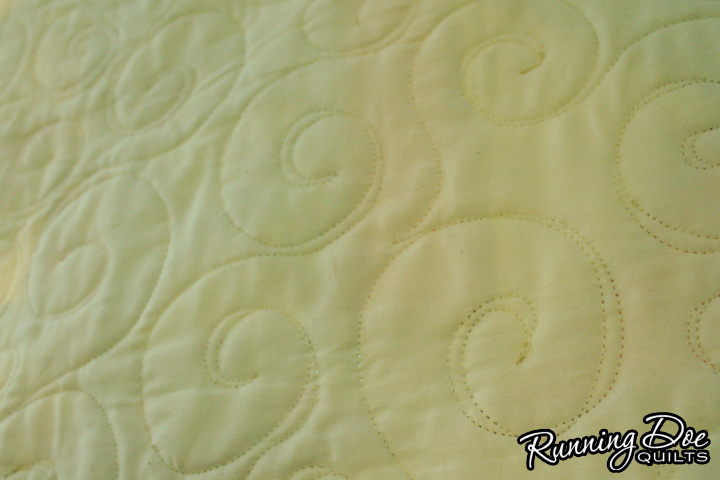 I also included instructions for raw edge appliqué if you’re not up for the challenge, but I really love the finished look of no raw edges. 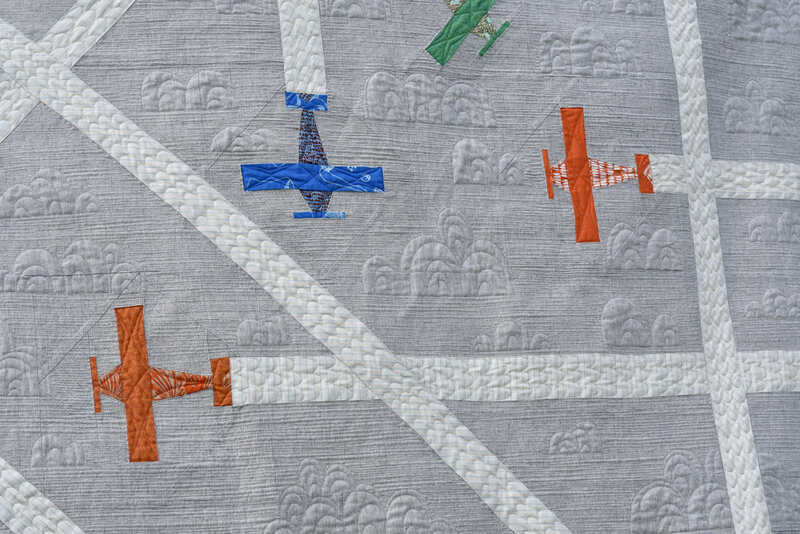 If you’re feeling intimidated when it’s time to start, I recommend making one airplane and piecing it into a throw pillow. You’ll feel much more confident after you’ve done it once! Thanks for your support and happy sewing! Lots of lovely showers = lots of lovely hostesses = lots of hostess gifts to make! Between all of the showers thrown for Asa, there were a total of 10 hostesses! I wanted to create something each person would love, but I was also short on time & energy. This table runner was the perfect answer to my problems! I designed the pattern to use 2 fat quarters (or 1/4yd cuts) with almost no waste. Just pick a fabric + coordinate you know the recipient will love & the runner comes together in no time! The hardest part was binding around the odd angles, but I found some great tutorials online. Just watch a few & decide which method you prefer. If you'd like to make you own, you can download my free pattern here. I have had a small obsession with flying geese lately, so don't be surprised if everything I make for a while has an abundance of them! 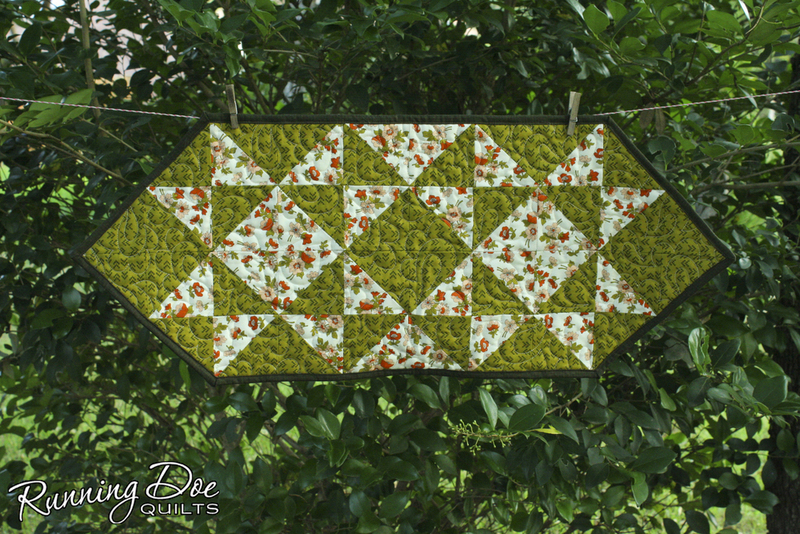 The quilting on this quilt is pattern B4 in my design catalog. It's become one of my favorites because it is so versatile. 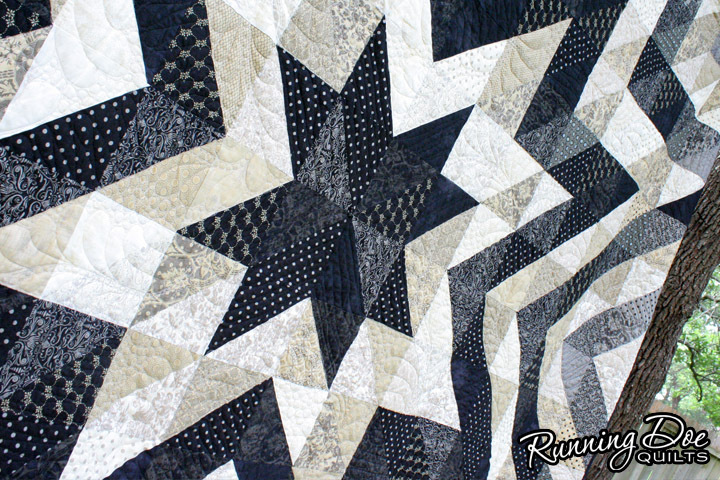 I've used it on all kinds of quilts, from modern to traditional! Villa Rosa Designs has started publishing some of my patterns, and this one should be available soon! So far Lazy Goose is in already in print, with Asagail & Migration on the way. 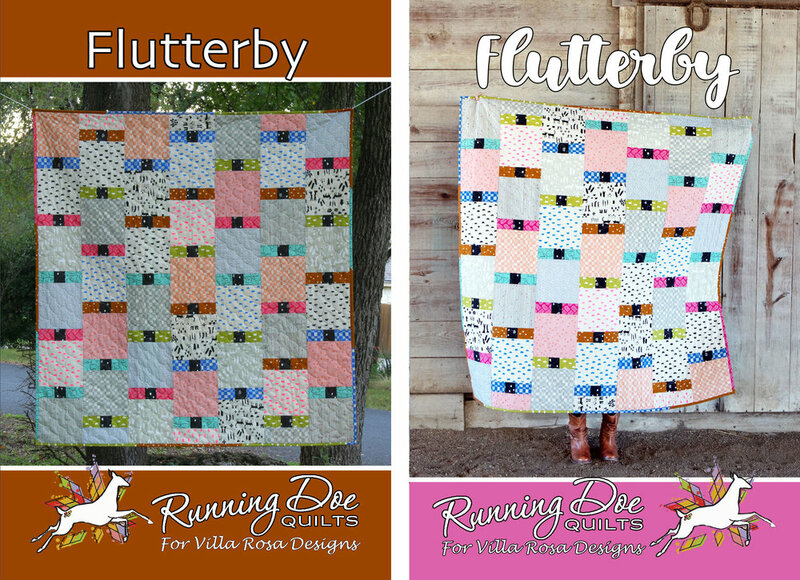 Check out their website or ask about it in a quilt store near you! I knew it had been a long time since I blogged, but I didn't realize exactly how long it had been till I logged on today & saw Oct 3rd as the date on my last post. YIKES! But...I have a GREAT excuse! It may not be a quilt, but I've been making something awesome! That's right...baby on the way! At this point, I'm a little over halfway to my due date. Our little guy should be here by the first week of August. I wanted to make something for the baby right off, but we didn't have the gender till earlier this month. So, I had to go the gender neutral route. The name of this quilt is the nickname my family gave the baby before we had a gender. It's a combo of the boy name & girl name we had picked- Asa for a boy + Abigail for a girl= Asagail. It's a simple block, that makes a lattice pattern. The measurements were picked to efficiently use a fat quarter tower I had of the Cotton & Steel, Clover line. 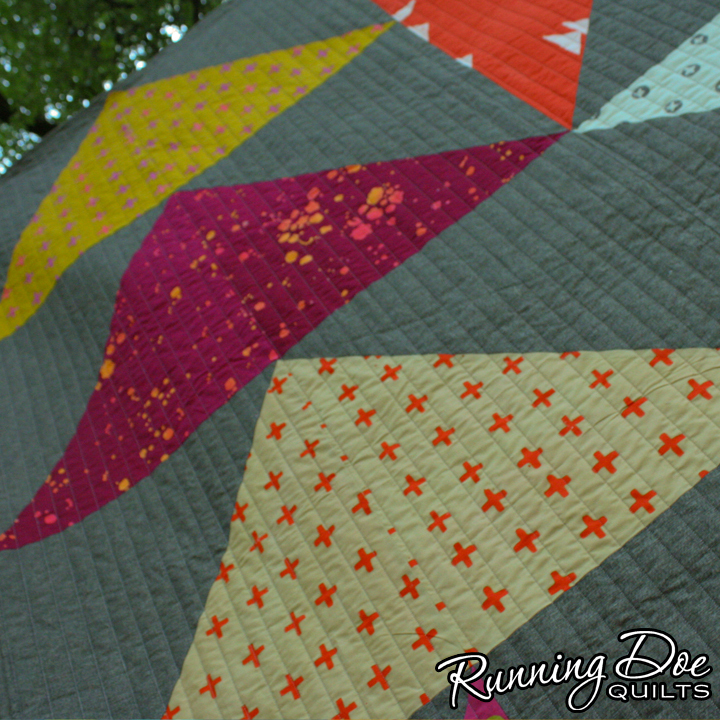 Then, I pieced all the leftovers together for a fun scrappy back. The good news is that I have been crazy busy longarm quilting, the bad news is that my person sewing time has shrunk drastically! 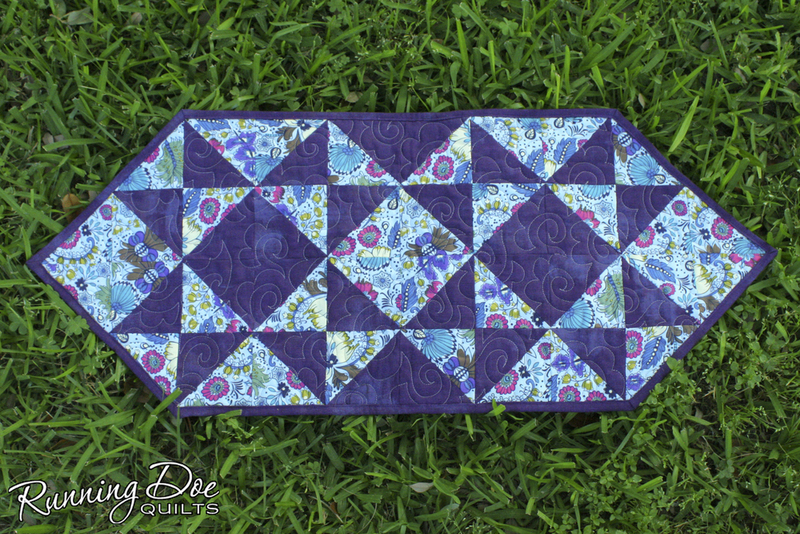 Still wanting to have something to show for the month, I got the bright idea to whip up a mini quilt for myself. It's the perfect quick and easy way to get some creative satisfaction....NOT! 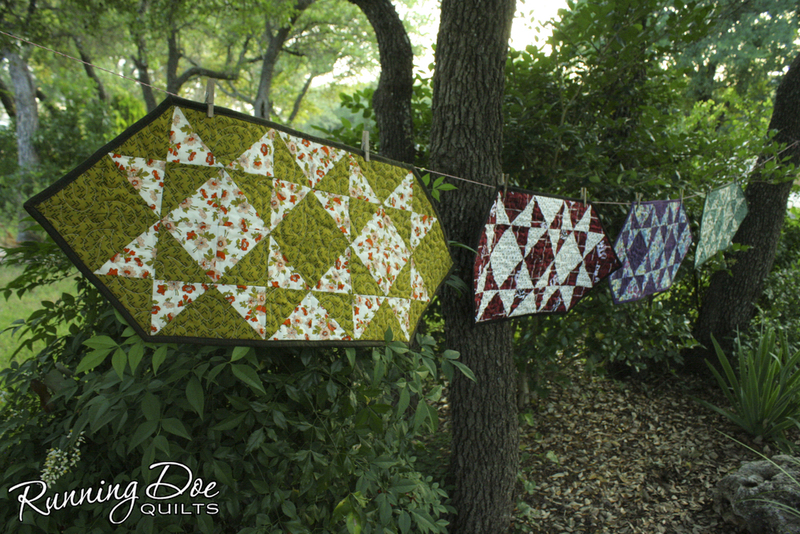 I now have some serious respect for all those mini quilts I see people whipping up! I always thought they were awesome, but I had no idea how much work went into such a little thing! From over analyzing every detail, to realizing that a lot of decisions are more critical at this scale, I spent a full two days designing, creating, re-designing & recreating this guy. It kept trying to grow on me and I had to finally design a bed quilt pattern from one of the alternate layouts, so that my brain would let me think small on this. It may not have been the quick & easy I set out for, but it was tons of fun & I plan on doing it again soon! So excited to be finished with this project! My inspiration came mostly from the fact that I just couldn't bear to cut some of the fabrics! The arrows and the splatters were my biggest hang-ups, because they are just so awesome as big pieces! All of the flying geese are made with Allison Glass Batiks and the background is an awesome gray that I unfortunately lost the selvage for (so I can't remember the name). 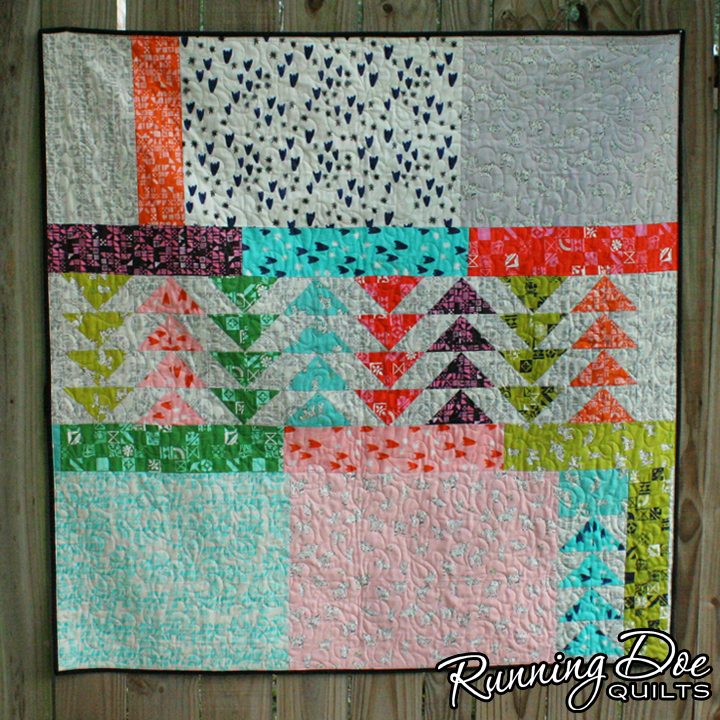 This quilt got its name from the very large (fast & easy) flying geese blocks that make it up. An afternoon of sewing should be ample time to complete the top. When finished according to the pattern, it will fit a lap or a twin sized bed. 64" x 80"
An added bonus is that this quilt is easy to re-size. You can cut any size squares you want (as long as they're all the same size). As always, send me your questions and any feed back is welcome! Wahoo! Free Pattern Download (click here). I made this bag to use as an on-the-go tote for everyday. It is especially great for going places where you might need to tote something wet or sandy. And as an added bonus, it makes an excellent grocery bag for those of us living in bag-free Austin. It should come together quick & easy, but don't hesitate to e-mail me with questions/ comments. I always welcome pattern feedback. 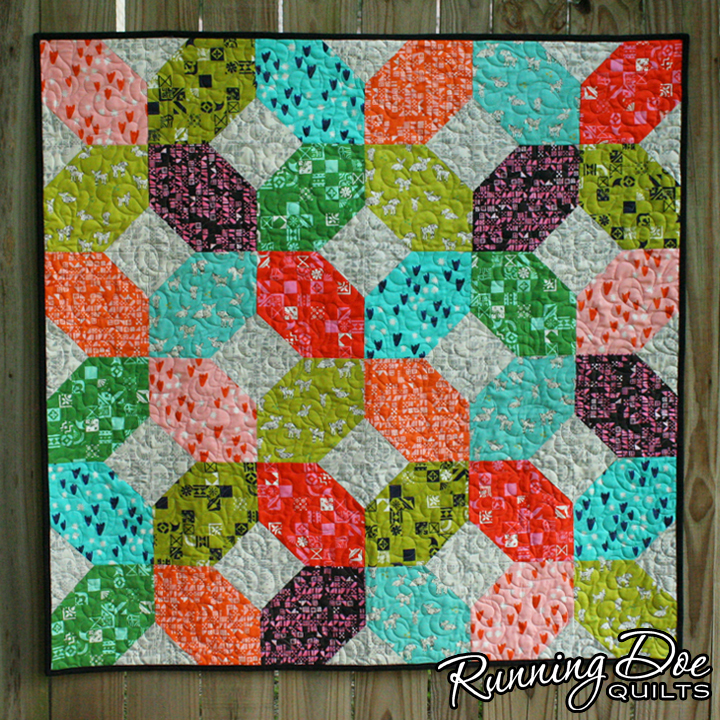 This quilt was inspired by a quilt I saw on Pinterest awhile back (seen here: http://talesofineptitude.blogspot.com/2013/11/finished-quilt-and-bad-pictures.html). 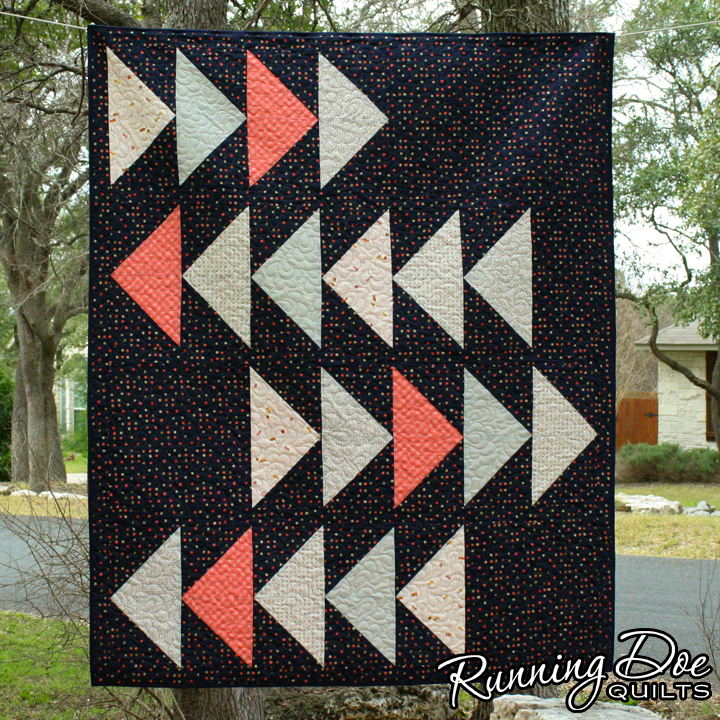 It probably wouldn't have gone past a mere appreciation of her quilt, except that I fell in love with the "Little Black Dress 2" fabric line by BasicGrey for Moda. None of the fabrics were individually what I would normally pick for my stash, but all combined they were irresistible. 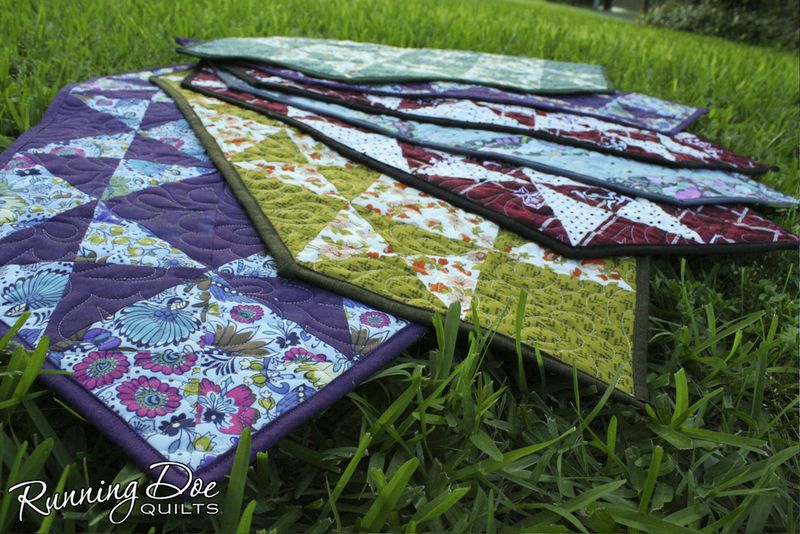 So, of course, I had to come up with a project that suited them and make a whole quilt! Good Morning Starshine was the perfect inspiration, because I could simply alternate the black and tan. 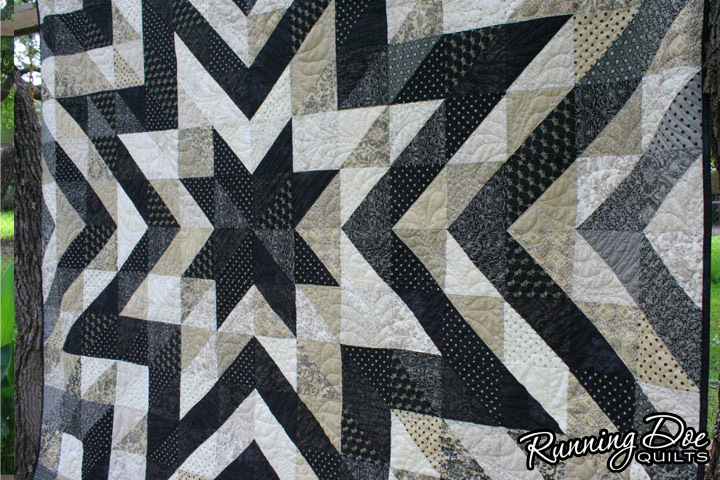 An added visual bonus was that I could put the grey in the black rows towards the outside of the quilt and make it seem to trail off. If I did it again, I might offset the star just a little more to the left for a more dramatic effect. Spencer keeps trying to center it on the bed because he never noticed the offset. 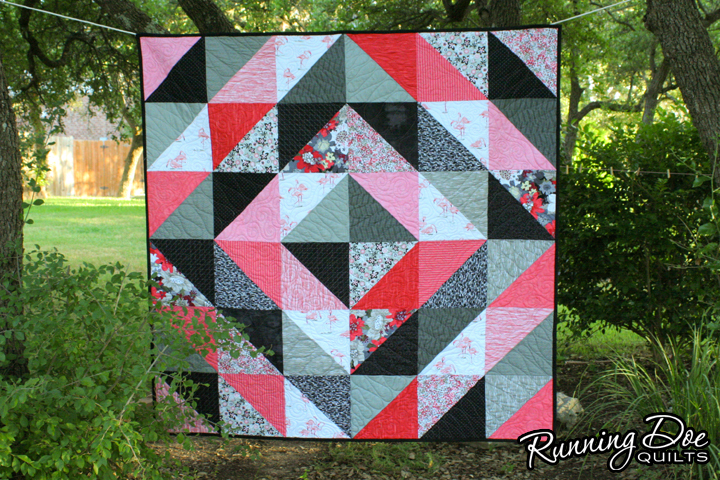 But otherwise I really love this quilt! I also think it might be a favorite of Spencer's.